These Donuts Aren't "Bearscat" - Word on the street with Visit Minot!Word on the street with Visit Minot! When you hear the word “bearscat” the first thing to come to mind probably isn’t donuts, but this Bakehouse is here to change your mind. 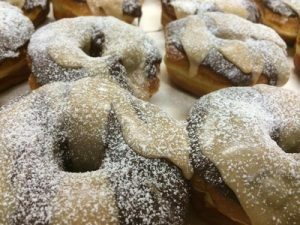 Bearscat Bakehouse specializes in baking donuts, and who doesn’t love a good donut. 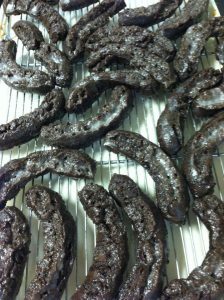 The name, Bearscat, is an old cowboy term for donuts. The owner, Kevin Cavanagh, found the word in an old cowboy dictionary and thought it would make a great name for their new Bakehouse. 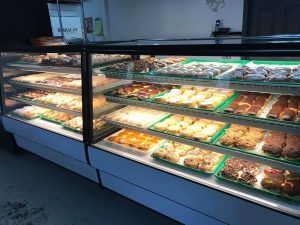 Cavanagh bought the Donut Hole in Bismarck in 2006, but in 2011 they changed the name to Bearscat and then opened their second shop in Mandan in 2015. 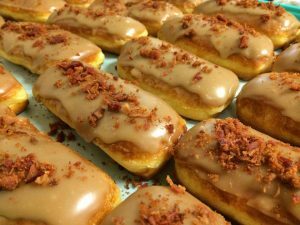 In 2018, they opened their newest Bakehouse in Minot. People would go into their Bismarck and Mandan locations asking Cavanagh to open in Minot and he knew they needed to, after searching for a location for two years they found one and opened at the end of July, and they have had nothing but success since. Their opening day had lines wrapped around the building and lines out the door. Bearscat makes strictly donuts, they want to do one thing and do it well, but you can get donut cakes. They are donuts, but they are cake size. 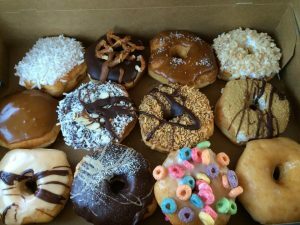 Don’t expect just the classic donuts like a chocolate or maple donut, Bearscat makes over 100 different kinds of donuts. They find new and creative ways to make their donuts unique. They do have the classics, but other favorites include, their namesake Bearscat donut, Glazed, Bavarian, The Elvis, S’mores, and Samoa. If you want to check out more of their donut creations check out their Facebook page. You donuts are absolutely the best! My husband and I always go to Bearscat when we hit Bismarck! So nice to have a place like yours to come to! We have tried quite a few of your tasty items and to date have never gotten one we didn’t care for! Happy to have a Bearscat closer to home…we live in Kenmare. Thanks for all of your hard work! Glad it’s starting to pay off for you!